Beginning farmers connected with landowners and a wide range of advisors at the March 28 Seacoast Farmland Access Info Night and Farmer Mixer held at the new Smuttynose Brewery in Hampton, NH. Over 100 farmers and farm supporters turned out to explore strategies and challenges facing beginning farmers in New Hampshire. According to the recently released results of the 2012 USDA Census of Agriculture, New Hampshire and other New England states are bucking a national trend by increasing their number of farms and land in farms. The large farmer turnout reflects a surging interest in farming as described in the new report, Northeast Agriculture: 2014 Insights and Perspectives by Farm Credit East. “Attention to the needs of beginning farmers is due in part to concern over our aging farmer population as well as a consequence of the food movement which is attracting new farmers and their advocates,” says Melissa Blindow, the New Hampshire Field Agent at Land For Good and a small scale dairy farmer in Goffstown NH. “Beginning farmers are a diverse population with diverse needs. Access to land is one of their most pressing issues.” With over 70% of farmland expected to change hands in the next 20 years, a new generation of farmers needs information and support to keep the state’s farmland in farming. Last week’s Farmland Access Info Night and Farmer Mixer was the most well-attended Farmland Access Info Night that Land For Good has organized across the state since 2012. Farmers and service providers explored strategies to get onto farmland and tackled other top challenges facing beginning farmers in New Hampshire. Said one farmer, “I felt the scenario role-playing format was incredibly effective to navigate through a complex series of organizations and issues.” Members of the local agricultural community were also in attendance. 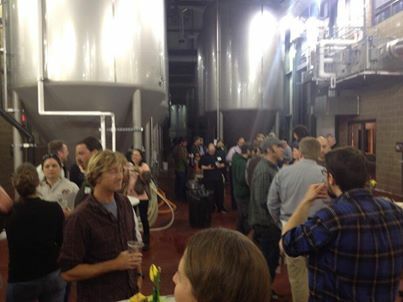 The event was sponsored by Land For Good, Northeast Organic Farming Association of NH, Southeast Land Trust of NH, Seacoast Eat Local, and Smuttynose Brewing Company. Food was provided by Blue Moon Evolution and featured all local farm ingredients, and local beer was provided by Smuttynose Brewing Company at their new location on Towle Farm Road in Hampton, NH. Support for this event was provided in part by grants to NOFA-NH and Land For Good from the Thomas W. Haas Fund of the New Hampshire Charitable Foundation.